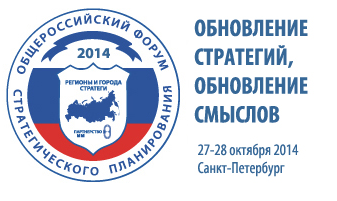 On October 27-28, in St. Petersburg All-Russian Forum “Strategic planning in the regions and cities of Russia” will be held. The main topic of the Forum is “Strategic planning in the regions and cities of Russia: updating strategies, updating meanings”. Green Day Forum: the values ​​of sustainable development. As part of panel discussions and round tables the following issues will be raised: update of existing policies, the implementation of mega-projects, development of special areas (Arctic, Far East, Primorsky region), an inter-regional transport infrastructure, implementation of regional investment standards, spatial development in the Baltic Sea region, agglomeration processes. The Forum is the leading social platform of the country, where the complex issues of long-term development of regions and cities, especially the planning of their development are discussed.